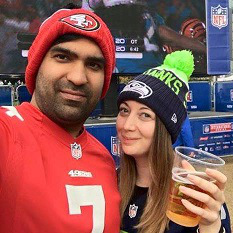 As part of our series in celebrating female NFL fans across the UK, I’d like to introduce you to Helen Stirling, a Cincinnati Bengals fan. Helen shares with us how she got in to the NFL, how she made the choice of her team as well as more about her overall experience as a fan. 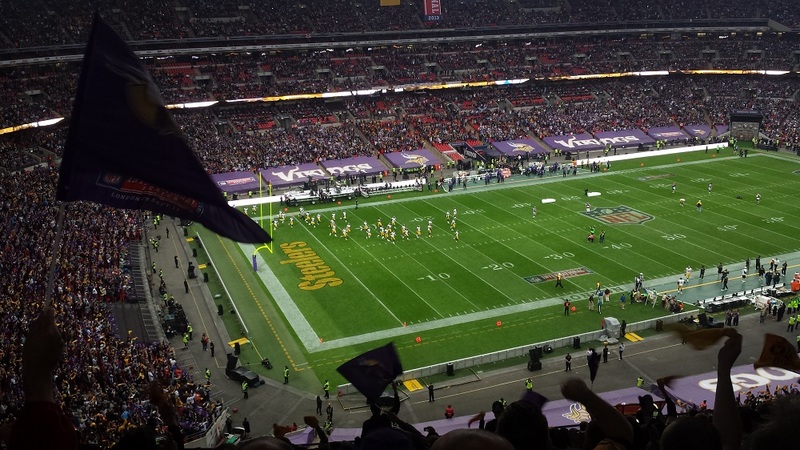 We had a look to see what was happening the weekend we were going to London, and it turned out the Pittsburgh Steelers were playing the Minnesota Vikings. The decision to find some tickets was definitely helped by the fact that my other half had been binge watching Friday Night Lights. “Clear eyes, full hearts can’t lose,” as I heard him say about 5,000 times that weekend, while trying to recreate Coach Taylor’s heroic squint. On the tube to Wembley we were talking about who we were going to support for the game (we literally had no clue about the sport at this point, beyond the hometown drama it causes in rural Texas). I decided to support the Steelers (shudder), and Hass chose the Vikings. When we got to our seats we discovered it was a Vikings home game and we all had flags to show support, so luckily I very quickly changed my mind to support the Vikings! The game and the atmosphere was electric and we were instantly hooked – even if we had to Google the rules of the game as we watched. Initially I loved the big plays. The turnovers, the touchdowns and the deep bombs! As my love for the game continued I got more involved with understanding the strategy of the game and play choices, though, I still love seeing AJ Green catching a seemingly impossible hail mary pass. So how on earth did I end up with the Cincinnati Bengals as my team, you ask? Well, a week or so down the line we decided we needed to get into the rest of the season before it was over for another year. So, it was time to pick teams. Hass decided pretty easily that it was the Cowboys for him (his love for Kyle Chandler and Friday Night Lights is never ending). For me, I thought the fairest way was to pick a US state at random. So, because it’s a fun word to say, I picked Ohio, which Hass told me was actually one of the places with more than one team So, I had to pick between Cleveland and Ohio… and luckily I made the right choice. That’s the moment I became a Bengals fan. In 2014 we were lucky enough to see two International Series games. First, we couldn’t miss the opportunity to see the Cowboys for Hass, especially as Tony Romo had overtaken Kyle Chandler’s place in his heart at this point. And then I was super lucky that my work had two comp tickets for the Lions Falcons game, which was a thriller! Don’t worry, I’d learnt all the rules at this point (except the old catch rule…). Then I was well and truly hooked, even being part of a small fantasy league with our friends, and, not bragging, I won. Only girl in the league! Being part of the fantasy league really helped me to get to know other teams, players and coaches, as I’d watch the other games to see how my players were doing, which I’d never really done before. I kind of had Bengals tunnel vision (and I still do a bit). I’d been to at least one game in London every year since then, until 2018 (we couldn’t make it last year as we went travelling). Bills vs Jags with our friend Rich in 2015, and then in 2016 I was super hyped because THE BENGALS WERE COMING TO LONDON! I managed to get us into the ‘NFL House’ experience that NFLUK hosted, and I got to see some of the Bengals players and Marvin. It happened to be Andy Dalton’s birthday, and the whole crowd ended up singing Happy Birthday to him, which was pretty funny and definitely not at all awkward…! The game, as you may or may not know (spoiler!) ended in a tie against the Redskins, which, although not the preferred result, was better than seeing them lose! I completely lost my voice from booing on Skins third downs and screaming when we scored, and I caught a Bengals T-Shirt form the T-Shirt cannon! It was such an amazing day and I’ll always remember it, and you know I’ll definitely be there if they ever come back to London. One of my goals is to get over to Cincinnati and watch a home game at Paul Brown Stadium, I can’t wait for that day! I also want to give a quick shout out to the UK Bengals community, which is so great and welcoming, and they’re always on top of organising events and meet-ups (which I sadly haven’t made it to yet, but I will!). You can find them on Twitter @WhoDey_UK. Just don’t tell them about my 2013 Steelers slip up! So, although our season this year did not end well, there are big changes ahead with most of our coaching staff having been let go, including Marvin, who is all I’ve ever known as head coach. I’m really excited to see what happens post-Marvin though, and hope we can get back to a winning season in 2019! Who Dey!